I love making tostadas because I can easily please everyone in our family. The kids prefer them without onions and salsa, my husband and father like them with the works, and I eat them without the meat. I was able to make 15 of these for about $7.00. Not to shabby for feeding a family of six. I was very excited to use fresh butter-crisp lettuce and green onion chives from my garden. Heat oil in skillet until sizzling hot, but not smoking. Fry corn tortillas until crisp. (about 45 seconds per side.) Place on sheet pan. Brown meat and add spices to taste. Drain fat. Spread refried beans in a nice thick layer on each tortilla. Add meat and top with cheese. Bake in 350 degree preheated oven for about 10 minutes. Remove and top with whatever suits your fancy! A few words about tostadas. Tortillas are thought to have been served up 2000 years ago! The traditional tortilla has been made of maize (corn) since pre-Columbian times, and involves curing the maize in lime water then grinding and cooking it, kneading it into a dough, pressing it flat into thin patties, and cooking it on a very hot griddle of sorts. 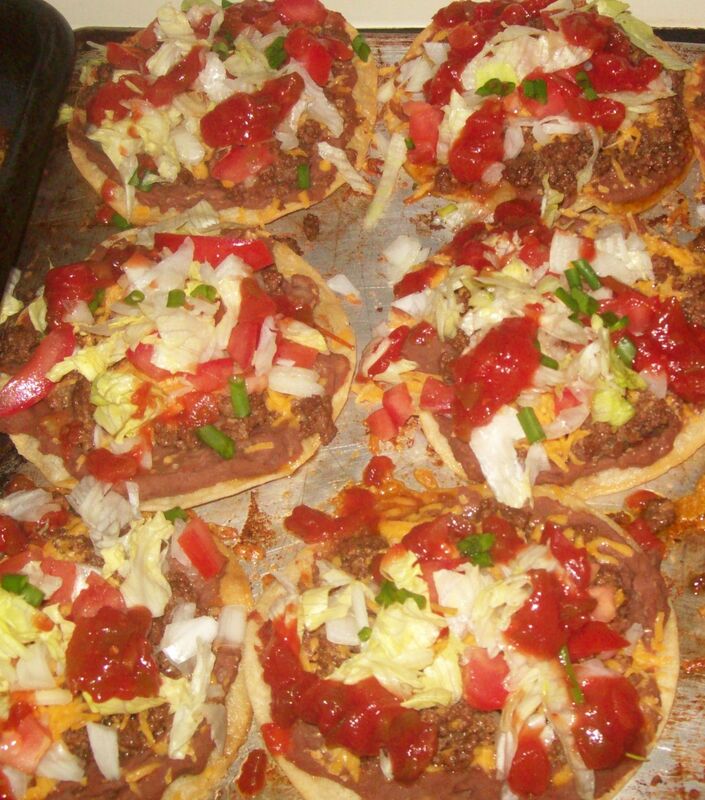 Mexican tostadas are usually made with pork instead of beef and generally contain spicy chili peppers. Posted by Createityourself on May 24, 2012 in Cooking and Baking and tagged cooking, corn, recipes, tortillas, tostadas. yuuuuuuuuum mexican always gets a big ‘yes please’ from me! We must be sharing a vibe, I just made and posted about my chilli con carne! lol. sounds tasty,might make them for lunch. thanks for the recipe! These look so good – can’t wait to try this! Just need to wait till the summer produce becomes available, so we can have these. Pity it’s not summer yet, as the weather suggests we should be able to eat them here now!